We felt that there was a better way to transport horses in a trailer rather than using the long established traditional designs. After years of research we found Fautras, a French company established by top equestrian rider Jean Luc Fautras. He personally invented and developed this new concept in horse transportation. We can provide you with first hand knowledge of these unique trailers as we always have a demonstrator in daily use. We believe that the innovative ideas and quality of these trailers are second to none. We would be delighted to demonstrate one of the large range of trailers to you. Fautras trailers are made to a superior standard, their quality is second to none. They have a rot proof polypropolene floor, guaranteed for life, safety roll bars, large sliding windows with grills, the galvanised steel chassis is guaranteed for 7 years and the whole trailer is guaranteed for 2 years. With guarantees like this you can be sure of the quality. The Oblic+ range provides horse trailers from 2 to 4 horses with diagonal or herringbone transportation. A modern and elegant line which makes it possible to optimize the transport of the horses. Oblic elevated Fautras to the rank of European leader for this type of transport. The diagonal or herringbone position makes horses travel much more comfortably, even bad travellers can be transported with ease. 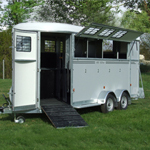 The partitions can be adjusted to divide the space in the trailer to suit your horses. By increasing the distance between the horse and trailer, traditional entrance with a ramp makes loading less inviting for the horse. The Fautras® equine friendly entrance is an American style step in entrance (2 doors and no ramp). It allows the horse to move forward into the trailer without the obstacle of the ramp. Worldwide experience has shown benefits of this system especially for the nervous, young or unconfident horses. 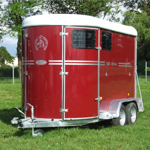 Fautras also make traditional forward facing trailers, the JMS Mare and Foal trailer, the Fautras Provan and the Fautras Promax 2. These trailers can come with the Patented Loading Aid System which means that the rear breach bar can be closed automatically meaning you can load your horses alone with ease. Your horses will no longer be able to reverse of of the trailer before you have run around to the back of the trailer! There are also many storage options available to carry your saddles and tack in the trailers. 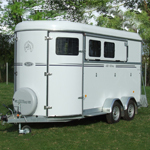 Fautras trailers really are designed for the horse and the rider, to make your life easy. Fibre glass trailer available in 6 colours for the transportation of 2 horses with transportation / slant load. Fibre glass trailer available in 6 colours for the transportation of 3 horses with transportation / slant load. Fibre glass trailer available in 6 colours for the transportation of 4 horses with transportation / slant load.